Home » Unlabelled » Big Day Tomorrow. Tomorrow is the first day of the new chemo drugs Taxol and Herceptin. I'm pretty scared and wish I didn't have to go through this. Hubby has been called away to work which makes me even more nervous. Thankfully my sister has offered to stay with me tomorrow night incase things get really wacky. Today I had blood drawn from my port for the first time (they need to draw blood prior to every chemo session and had been using veins up until now). 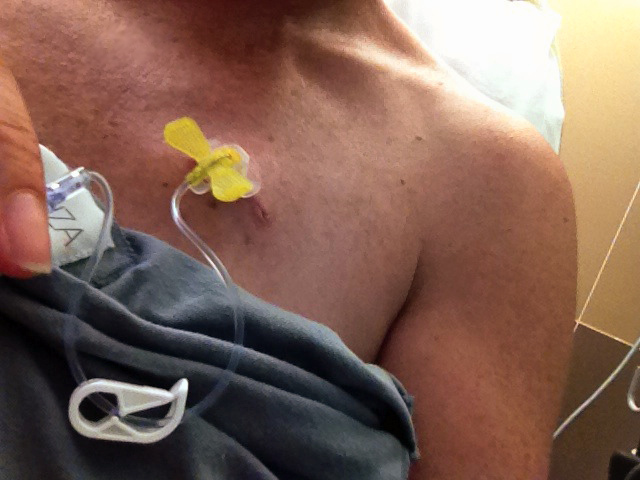 It was pretty painless and once again I was grateful for having the port installed. 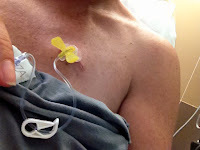 If anyone reading this is about to embark on a long chemo program and is wondering about whether to get a port of not, I recommend you speak to your Oncologist about it. It will save you a lot of pain and mess with your veins. Here is a picture showing them drawing the blood. They do the same thing when I get chemo except they are injecting in rather than drawing out. It's getting late now and I'm exhausted after the stress of the last week so I'm going to call it a night. I'll try to post an update over the next few days. Hope everything goes smooth. Taxol & Herceptin was ok for me until the last 3. You've done half, and there is a good response, that is very positive. Will send you a message about your previous post. Don't hesitate to contact me if you feel for it. Thanks Suzanne, here's keeping my fingers crossed and hoping for the best! Michelle, most women I have talked with didnt have many issues with Taxol (it's easier then A/C) ...I personally only had body pains as my worst side effect during... and it was not until a month after I finished that I started getting a tiny bit of neuropathy. But only at night. Not everyone gets neuropathy, so hopefully you won't! Hope the first session went ok today. Hang in there! Hi Ashley, one week down, 11 left to go. So far Taxol has been easier. You are correct about the body pains though. My goodness I feel like a 100 year old woman. My knees and elbows and thighs are in so much pain, I was wondering if my joints were swelling, so far they aren't but man they hurt. I really hope I don't get the neuropathy, it will be hard to type LOL!